Thriving communities are always looking at ways to support the next generation and Clann Credo supports them to do this. As Ireland’s leader Community Loan Finance provider, we can help supply the funds you need for your Community Youth Project. Clann Credo is a not for profit charity which considers the impact your project has on your community. 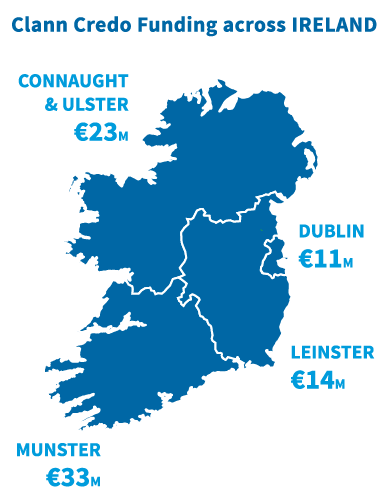 Clann Credo has loaned over €100m to over 900 community projects nationwide over the past 20 years. 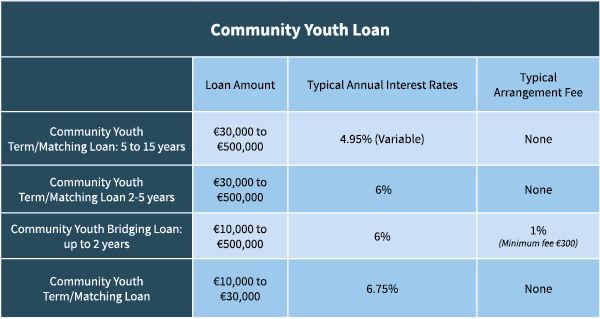 We have a special €5m Community Youth Loan Fund to help community groups access grants and funding by providing them with Community Loan Finance. LEADER Grants are paid following submission of receipts for works completed and paid for. Clann Credo can provide you with a Bridging Loan to pay for works done on your project allowing you to claim the LEADER Grant. The Clann Credo loan is repaid when your project receives the LEADER Grant. The LEADER Grant process may require you to show your organisation has sufficient match finance (own funds) to cover the cost of the project. Clann Credo can provide you with a Match Funding Loan if your community group doesn’t have enough reserves to avail of the LEADER Grant. Clann Credo’s repayment terms are flexible. - Access to a range of extra benefits from our partner organisations, The Wheel and TrustLaw.